Knomia Teach - All about apps in YOUR classroom! If you're thinking about trying some flipped lessons this year, take a look at Knowmia and the Knowmia Teach iPad app. This is a website and an iPad app that allows for creating, sharing and viewing video lessons. The Knowmia Teach app seems to have far more creation options than the similar Showme and Educreations apps. You can draw free-hand on the whiteboard screen, type on the whiteboard screen, and insert pre-made shapes and figures. You can also use pictures and video clips in your video lesson. 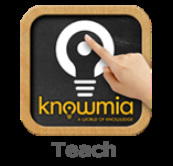 Knowmia Teach app includes the option to use your iPad’s camera to record yourself while drawing on the whiteboard. You will appear in the corner of the screen so that your students can see you while you’re talking them through the lesson. All Knowmia Teach lessons you create can be uploaded to the Knowmia website with just one tap of your iPad’s screen. Students can watch your lessons on the Knowmia website. If you’re thinking about trying to create some “flipped” lessons for your students, take a look at Knowmia and the Knowmia Teach app. This app is simple to use and can be used across all subject matters. Think about using this app not only to create lesson videos for your students but have your students create videos for the classroom. Click here to access the Knowmia website and create a free account.